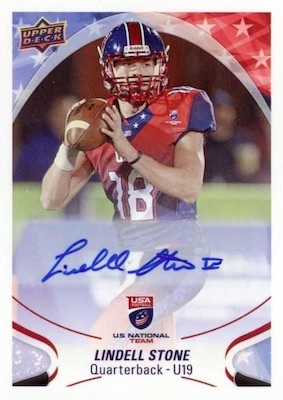 2017 Upper Deck USA Football is back on the field with top prospects and a new format. The set is again found on the online ePack platform. More hit-based compared to the 2016 release, each pack averages one autograph or memorabilia card. 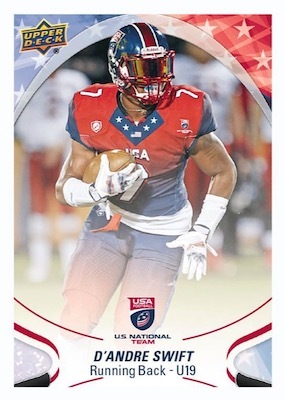 Featuring teenage athletes on the U-17, U-18 and U-19 national teams for USA Football, the 200-card base set also covers some of the best players from Canada. Although these are digital cards, the entire 2017 Upper Deck USA Football checklist is available through the parallels, which can be mailed to you. Those who combine five of any base card can elect to redeem them for a physical version. The first 100 cards (#1-100) yield Blue Border cards, while the final 100 cards (#101-200) offer Red Border editions. 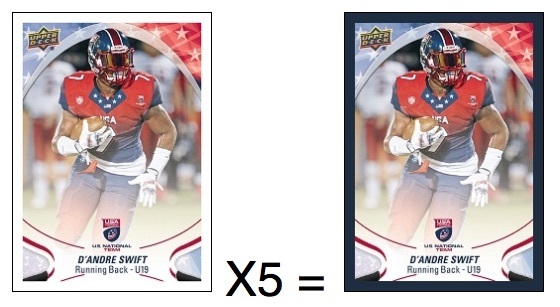 2017 UD USA Football also has Retro Achievement cards that correspond to building the full parallel sets. Redeeming the 100-card Blue Border parallel earns one random player from the nine-card 2012 Retro set, while the full Red Border parallel does the same for the 2011 Retro set. These Retro cards are not found in packs. The 2017 Upper Deck USA Football hits include autographs at 1:1.5 packs, and memorabilia cards at 1:3.5 packs. 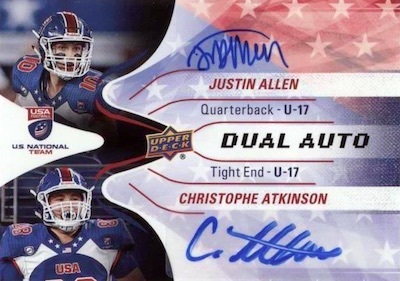 Most common is the Flag Wave Autograph (1:2 packs) parallel. 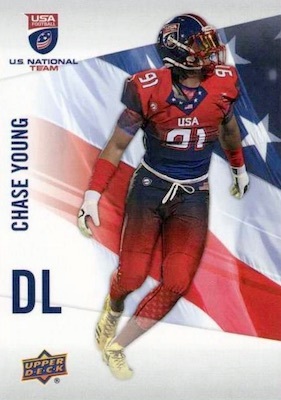 The USA U17 Dual Auto insert is more limited at 1:6 packs. Finally, the Triple Auto cards are an achievement earned only by collecting the entire Flag Wave set. Collectors receive one random card from the 10-card set. Memorabilia choices include USA U19 Future Swatch (1:4 packs) and the rare Premium (#/22) parallel. If you collect the entire Premium set, you earn one Premium Logo Auto (1/1) card. Each physical parallel is earned by combining five of one base card. PHYSICAL PARALLEL CARDS: Blue Border (only #1-100), Red Border (only #101-200). 100 cards. 1:2 packs. 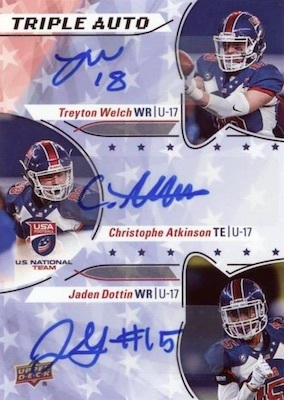 Shop 2017 UD USA Football autographs on eBay. 10 cards. Not in packs. 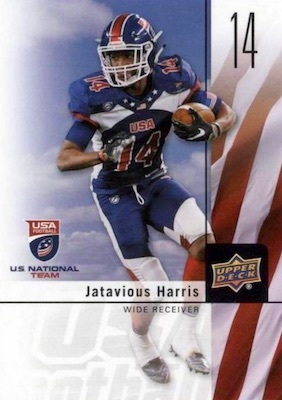 One random card awarded for completing Flag Wave Auto parallel set. 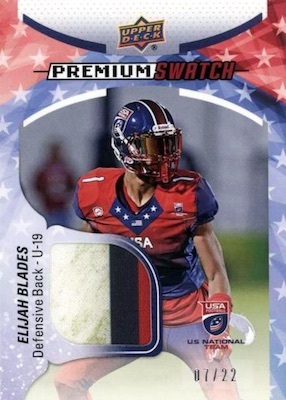 PARALLEL CARDS: Premium Swatch #/22. 22 cards. Serial numbered 1/1. Not in packs. One random card awarded for completing Future Swatch Premium parallel set. 18 cards. Not in packs. 2011 - one random card awarded for completing Red Border parallel. 2012 - one random card awarded for completing Blue Border parallel.